Dad has been out of commission for several days, at least during my observations, due to an injury he sustained either from an aggressive dog or possibly from a fight with a raccoon: his face and head have lacerations, and he limps on both his left legs. I’ve noticed that injured coyotes lay low for a while. Because of his recent absence, he may have a need to re-establish his position in the family hierarchy, which may be why he puts this pup down. The youngster submits easily. Mom is to the right. She has just finished a pretty amazing harsh attack on this youngster’s female sibling. Is this youngster fearful of the same punishment which has just been dished out to his sister? This coyote was hoping to slither quietly along without being detected when, directly ahead, there appeared an unleashed dog. 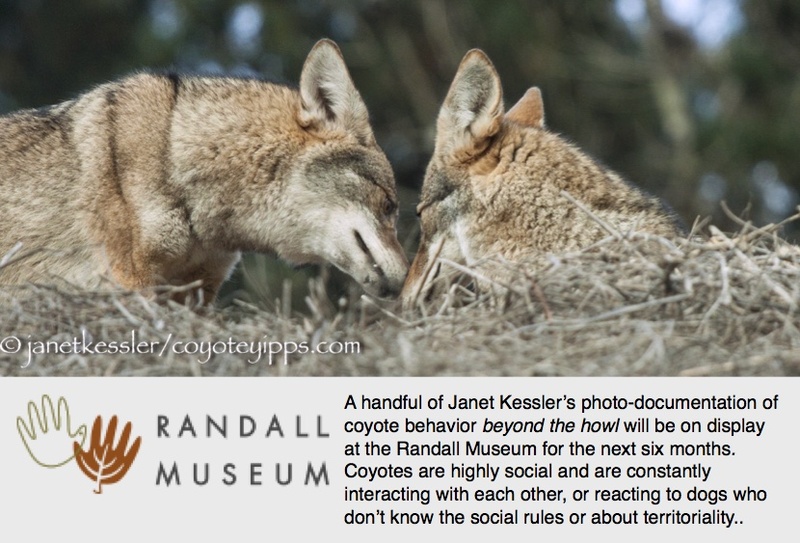 You can read what the coyote is thinking through its posture, eyes and ear positions. The dog does not see the coyote at first, and continues to play with its owner. By standing or sitting very still, coyotes often can evade detection by those who are occupied doing other things. But the dog does finally glimpse the coyote, and when he does, he goes after it. Coyotes don’t always just flee. Sometimes they will stand up for themselves when they are chased by engaging in a long, distressed barking session, or by chasing back. In this case, the coyote just wanted to escape the dog, and it did so by speedily dashing away and then ducking into a thicket of underbrush. The dog could not follow, so he returned to its owner. The wind was pretty strong when this coyote stopped at a palm tree where the fronds were whipping around strongly. The coyote was startled and scared, jumping several feet, and then fleeing, but only a few feet. Curiosity was stronger than the fear, because the coyote returned again and again with the same response. Slowly the coyote calmed down, and just watched for a few minutes, and then trotted off on its merry way. This is a young coyote, still learning about the world. It was fun to watch and reminded me of an incident with my own dog. My dog, a large 96 pound lab-mix was not by any means a fearful dog. However, on one of our normal everyday walks, on the planted space adjacent to a sidewalk, someone had placed two life-sized ceramic geese. They must have looked pretty real and been somewhat scary, because my dog went up very carefully, stalking and walking low, and absolutely ready to flee. These geese were not even moving. But my dog approached, growling and ran back. Then he did it again, and then again. There was a NEED to approach, yet a fear. This was the exact same behavior as the coyote when it reacted to the palm fronds whipping around in the wind. I was alone when one coyote came in my direction. It stopped when it saw me and placed its front paws on a rock to lift itself so that it could see me better. I stopped to watch it and I was very still — it was probably curious because of my own stillness. This stillness often increases a coyote’s curiosity: it wants to know what you are doing and where you are going, and it can’t figure these out when you are still! The coyote did not hang around long, just long enough to get a good look. In a second example, the set of two coyotes, pictured above, had been fleeing from a group of dog walkers when they happened in my direction. Again, I was alone and very still as I watched them — they approached a short distance to look at me. At the same time, they kept their attention mainly on the dog group which was coming in their direction. Dogs have often chased coyotes, so the coyotes often are wary and defensive against dogs, especially the more active dogs. As the dog walkers approached, the coyotes fled. In my third example, I saw a coyote which was very shy. It saw me walking on a path. Without stopping, it hopped up on a rock to get a better view of me. I continued walking. I could see that this coyote was uncomfortable that it had been seen. It did not stay to examine me, but fled very quickly and I did not see it again. Please keep your dogs leashed in a coyote area. Please see the posting at the head of this blog: safety measures for keeping a coyote from coming too close. Coyotes in our parks have never come up to humans, though they have approached some of the dogs. Please keep a safe distance for your own, your dog’s and the coyote’s safety.